Having been about the only one that I know who has summited both Mt. 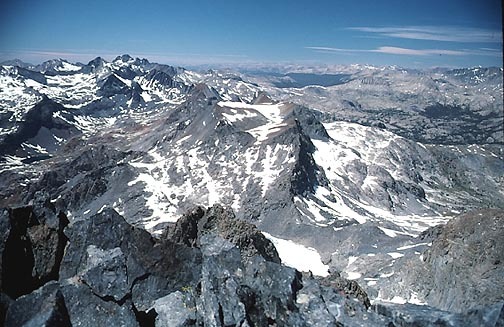 Ritter and Banner Peak, solo, even, on the same day, I wished to repeat another ambitious climbing agenda with the California Mountaineering Club. I heard that Mammoth locals often did Mt. Ritter, a class 3 climb with some 16 miles and 5,600 feet gain, round trip, in one day. It had become such a problem and expense to secure a wilderness permit for an overnight trip, I sought to raise the standards and do the peak from about dawn to dusk, as a day climb. I left home Friday morning to stop and check, for my peaks guide, on some Northern Sierra peaks enroute. I then climbed Sonora Peak (11,459'), the day before my big climb. I snapped my usual photos while driving south on U.S. 395. Meeting my lone participant, Jan, in Mammoth Lakes, CA, at 5:30 a.m. Saturday, at a cafe, I had breakfast while Jan had some "power juice." We drove over Minaret Summit to park at Agnew Meadows trailhead. I was able to use the outhouse, thus saving, from much "pollution," the backcountry, for this day. I try vigorously, nowadays, to clear my system at a proper facility before entering areas where there are no such conveniences. We began hiking at 6:48 a.m. A good trail runs in six miles, to Lake Ediza. This is the start of the cross-country ascent of this fine peak. We had to cross the lake outlet's creek, which was high from spring run-off. Jan lost her sock while preparing to wade across, but luckily, I had another for her. Our time seemed a bit slow, but I continued. I knew that we could return to the trail by sundown, and navigate back with headlamps. Climber's guides are notoriously vague about which way to go from about here. I took a beeline approach, straight up through the obvious chute through the cliffs at the base of the glacier approach. The objective is to climb, not necessarily follow directions. You do have to think for yourself, and not blindly obey from imperfect documents, and the foibles of climbers' memories and words. We approached the Southeast Glacier route snowfield which we directly climbed up on. It was mostly solid snow from here. We climbed diagonally to the crucial chute which leads through the upper cliffs. For some reason, this chute was bare of snow. The loose rock and some steepness is rated by guidebooks as class 3, although I think this warning is severe, and meant for beginners. Many people try to climb this mountain. Several Sierra Club climbers died near here in the early 1970's, although mainly from extreme weather. Our weather was perfect. 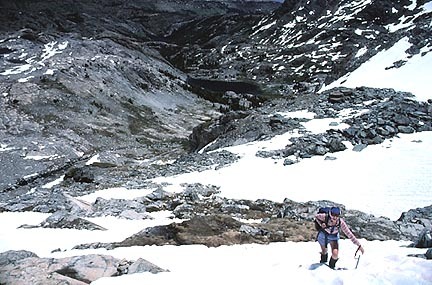 As I led up the class 2 rubble, then the 35 degree summit snowfield, I saw footsteps and ski tracks. Other persons had been here recently. I used the footsteps, which were big and well-placed. This probably made it easy enough for me that I didn't choose to turn back. Jan followed, but required short rests, which I waited for. I had an extra day's acclimation, so knew my advantage. By about 3 p.m., I summited. Jan followed in a few minutes. I busily read through the register, to determine who had signed in. Taking lots of pictures, I snapped the view toward Mono Lake, and the other peaks to the north and south. Later, I did a partial panorama, on my computer, using scans from my old Kodachrome slides. Jan wished to start back quickly, so started down despite my pleas to wait. I took more photos, then began down myself. The snow was now softer. I had fun with standing glissades, and we descended quickly. Back through the chute, we hiked quickly down the lower snowfield, then came back to Lake Ediza and the trail by about 6 p.m. We knew we had done it! A ranger came by, telling us that we were the first ones, that he had talked to this year, that had made it. It was only six miles back to the cars, so we had time to talk. We moved along well, then by old memories, I knew of a shortcut where we didn't have to cross the creek. We crossed the Middle Fork, San Joaquin River, on the footbridge, then hiked up the 400 foot gain back to the cars. We were there at 8:38 p.m., about dusk. Tired, but happy, we gave rides to two backpackers who had just come in also. We motored to the town of Mammoth Lakes over the Sierra crest. I wished to have a nice dinner somewhere, so we looked about. Picking a Mexican restaurant, we sat in comfort to have a celebration meal. I now like to relate, we had "breakfast in Mammoth, done Ritter, and then dinner." Most groups will take three days. I was to see in later years that some other climber had laid claim to this one-day feat. I knew well that I wasn't the first, but wrote or said nothing, except to write a short article, back then in 1994, for the CMC newsletter. The next day, I had another, easier, peak scheduled, but Jan's feet were too blistered. We toured the USFS ranger station, then parted ways. I had to get home to join another trip to central Nevada, so wasted no time to re-prepare.